79 Killed In California's Camp Fire As Number Of Missing Drops To 699 At least 82 people have died in the state since the Camp and Woolsey fires broke out earlier this month. The official missing persons list from the Camp Fire has 600 fewer names than on Saturday. 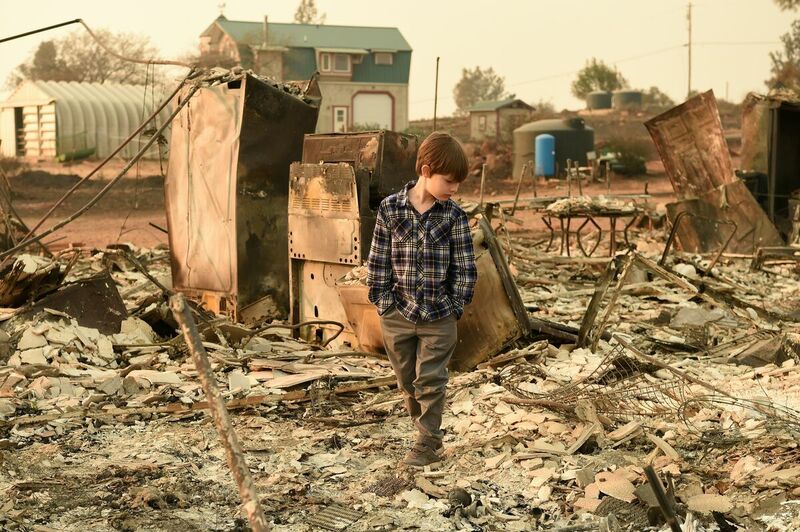 Jacob Saylors, 11, walks through the burned remains of his home in Paradise, Calif., Sunday. His family lost a home in the same spot to a fire 10 years earlier. At least 82 people have died throughout the state since wildfires broke out earlier this month. Three of those fatalities were from the Woolsey Fire in Southern California. The fire has burned about 151,000 acres and is 70 percent contained, as of Monday night. More than 4,700 workers are battling the flames. Authorities say they don't expect the fire to be fully contained until Nov. 30. More than 11,700 single-family homes and nearly 3,000 other buildings have been destroyed. The entire Northern California community of Paradise was reduced to a wasteland of ash and burned-out buildings and cars in the fire that began just after 6:30 a.m. local time on Nov. 8. The fire has burned 96,949 acres and is 96 percent contained, authorities said in their Monday night update. Hundreds of personnel are actively fighting that fire. Nearly all evacuation orders have been lifted, but that doesn't mean evacuees will be able to return to their homes. Damage assessment teams have counted 1,500 structures that have been destroyed by the flames. Authorities say they expect the Woolsey Fire will be fully contained by Thanksgiving Day.